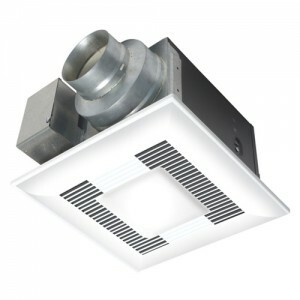 The Panasonic FV-11VQL6 WhisperLite Bathroom Fan with Light110 CFM for 4" duct is a ceiling mounted Panasonic bath fan/light combination; a two-in-one. It pairs excellent ventilation with hassle-free lighting to give you an all around pleasant experience. Don't waste your time, effort, and money on two separate bathroom fixtures for lighting and ventilating. This is a bathroom fan that is easy to install right out of the box. The Panasonic FV-11VQL6 Bathroom Fan with Light has two 13 watt GU24 bulbs included in this unit will illuminate the entirety of your bathroom, while the smaller 4 watt bulb makes a great night light for nighttime use! Functioning at low RPMs and sporting larger fan blades, the Panasonic FV-11VQL6 WhisperLite Bath Fan is certified as an Energy Star product and functions with a noise rating that is less than 1.0 Sones. With a possible circulation rate of 110 cubic feet per minute, the Panasonic FV-11VQL6 WhisperLite Bathroom Fan 110 CFM is a perfect solution for all of your bathroom ventilation needs. Please check your available ceiling space to ensure there is adequate room for bath fan housing! Duct Diameter (inches): 4" or 6"
Dimensions (HxWxD): 16.5" x 14.5" x 12.0"
While remodeling our home, I was looking for quiet but efficient exhaust. Panasonic had good reviews. Westside had several fans at decent prices. These are not cheap but worth every penny. I bought 2 of these fans for two bathrooms. Once of these is hooked up to a automatic timer switch. Absolutely love these!! They are really quiet, efficient and just do the job. They come with a really bright light and a night light. The night light feature is pretty good. We combined it with the blower function so we can tell that the fan is running (for the case when it is not on a timer). They are also very nice looking and unobtrusive. Westside delivery was great. It's not about 7 months since we are using these and they are great. I've installed about a half dozen Panasonic bath fans for clients in the past couple years. And they all love the quietness of the product. And I love the ease of installation and the flexibility of components that can be added. Panasonic is the only brand to consider. So quiet and west side prices are the best.